Unless you are a city dweller, you probably depend on your car or someone’s car to get you around. I confess. I love my car. It is an extension of my personality, and as I’ve changed and practiced better self-care, my car[s] have benefited from better care as well. And today, as I trade in my second Rav4, I am nostalgic. I’m thinking back to all our adventures as well as appreciating the day-to-day reliability of my car. I decided to write the following for the new owner and stash the note and picture in the manual that will go with the car with the hope that it will be found and that the new owner will appreciate my Rav4 as much as I did. He was my car from March 2010 to March 2015. We traveled +/- 96,000 miles together, mostly on the roads of Upstate NY. He’s hauled me and my husband, visitors, garden soil, tools, furniture, plants, bird seed, dog food, dog, cat food, reluctant cats, Christmas trees, hiking boots, snowshoes, trekking poles, luggage, groceries, workout clothes, yoga mats, farmer’s market produce and shopping bags. He looks especially adorable with a canoe strapped to his rack. Most of Ravi’s miles are local, back and forth to Saratoga Springs, with a weekly 165-mile round trip for business and a stop to see my son along the way. He’s traveled to remote trail heads in the Adirondacks, as well as shorelines of rivers and lakes. Although a country car, he always finds me the perfect parking spot on our very frequent trips to Saratoga Springs. He’s even navigated the streets of NYC. He waits patiently wherever he’s parked and we are always delighted to climb in for the safe trip home. We had only a few hair-raising adventures and close calls and absolutely no accidents, not even a fender bender. He always starts, even at temperatures below zero. He’s been stuck in the snow only once, this winter in a snow drift, because we forgot about his wheel-locking feature. He has been spoiled. He’s never been yelled at or abused in any way. He has rested nightly in a garage and received regular weekly washing, unless it was bitter cold. He’s been waxed and detailed several times. He has rubber mats at your feet and cargo area. He’s had all his regular maintenance and has only needed new windshield wipers and tires and a little work on the brakes. Oh, and once a mouse living in his air filter had to be evicted. Take good care of Ravi and he’ll take good care of you. Though I take the spirit of Ravi with me to my new and third Rav4, he comes with the good Car-ma! He/she will be happy to be renamed. This entry was posted in Uncategorized and tagged acceptance, cars, Cate LaBarre, Catherine LaBarre, change, choices, coaching, life coach, life coaching, self-care, self-help, self-love. Bookmark the permalink. Nice that you blogged about Ravi. I share your sentiment! Most of my cars have had names. My current Hyundai Tucson (which I absolute love) is Zippy! Very well written…….just as the new relationship is still to be written. Enjoy! 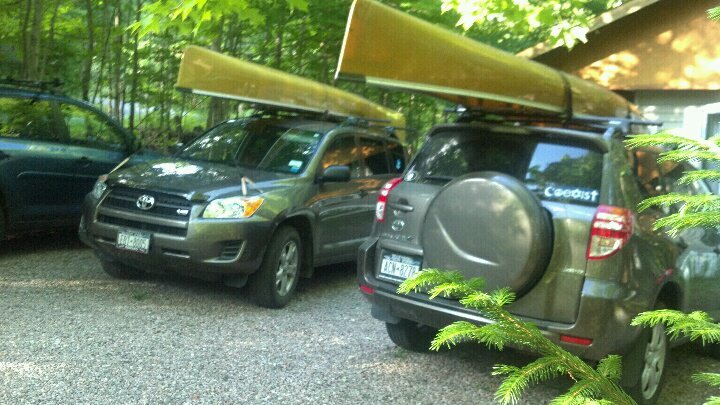 I am enjoying bonding with my new Rav4 Jason. Thank you for your wonderful attention during our new car purchase at New Country Toyota! Dianne, I have a friend and colleague who read my post and immediately went out and washed her 6 month old Subaru! Just writing this blog has made me feel more connected to my new car — it plays such an important role in my life — rarely a day goes by that I don’t get in it to go somewhere. It’s interesting to think of it/he/she as a friend, who keeps me safe and takes me where I want to go. What I give, I get back!